In response to the excellent questions posed by friends who commented on my entry concerning "photographic ethics", I've been thinking hard about how adjustments made prior to the making of a photograph differ, if at all, from those made afterwards, whether in a darkroom or Photoshop. As I noted in one reply, I can see all too readily how such a distinction would be susceptible to deconstructive critique. I use that term deliberately, since this separation of "before" and "after" strikes me as the sort of subtly ideological move that thinkers like Derrida were keen on interrogating, particularly in the aesthetic realm. Or, if you are of a more psychoanalytic bent, you could invoke the discussion of the "mirror stage", with its paradoxical temporality, to the same end. There is something inside us, whether imposed from without or arising from within, that wants to insist on the linear chronology that makes causality seem inevitable. Nevertheless, alhough I can imagine how someone would dismantle my argument that what the photographer does prior to the act of recording the play of light is fundamentally different from what she or he does afterwards to make the resulting image presentable, I still feel that this distinction is right and, what is more, with the full moral force that word can bear. I got out my copy of Walther Ruttman's 1927 documentary Berlin: Symphony of a Metropolis last night, a film of crucial importance for my intellectual development back in the early 1990s, and tried to see whether I could pinpoint what moves me about its "candid camera" shots of city life. I decided that the truth I could impute to those images, my conviction that they captured aspects of Weimar Berlin as they appeared to the people who experienced them firsthand, mattered to me greatly. Recreations in this era of computer graphics run wild may be finely textured to the point where they look real. But knowing they aren't puts them in a different category. I realize that this example confronts my dilemma obliquely, yet can't help but think that my sense of images from the increasingly distant past's truth is crucial to comprehending why I regard pre-photographic manipulation of focal plane, expopsure and frqaming differently than fixes and improvements undertaken after the documentary record has been established. I think the distinction that's important here is one of intention, not of technique. Is the intent to give the viewer a true picture of what you experienced? Or to lie to them? that is the only distinction that holds up once you start to pick it apart. I suppose you're right. I realized, in reading your comment here and on my previous entry on the subject, that I had taken the wrong angle. What I like about documentary films like Berlin: Symphony of a Metropolis is what they capture in the margins of the frame as much as what occupies its center. I'm opposed to cropping images, for the most part, because I feel like hiding part of the original documentary record represents a kind of untruthfulness. Again, though, that's a distinction that just won't hold up. If I "edit out" what I don't want within the frame before depressing the shutter, how is that any different from doing so after the photographic fact? And yet, I still want to hold on to that distinction, perhaps simply because it makes me like photographs better to know that I'm seeing all of what was in the original frame. It's so easy to create a new image from the raw material provided by a high-resolution digital photograph, to my mind. As you pointed out, though, many -- maybe even most -- of the folks who use Photoshop don't seem to have what it takes to turn the embarrassment of potential riches afforded them by the software into gold. But this is the crux of one of the most interesting things about photography, "the camera doesn't lie". The illusion that what comes out of a camera is somehow more truthful than a drawing or a written desrcription. People willfully work on maintaining the illusion that *really good* photography is completely transparent, and simply shows what was in front of the photographer. No "interference" from the technology or the human intermediary. But IRL of course in order to convey a perception you have to speak your truth in a language that the audience is likely to decode into what you intended. To me the unprocessed image provides a quite untruthful impression of Francisco. 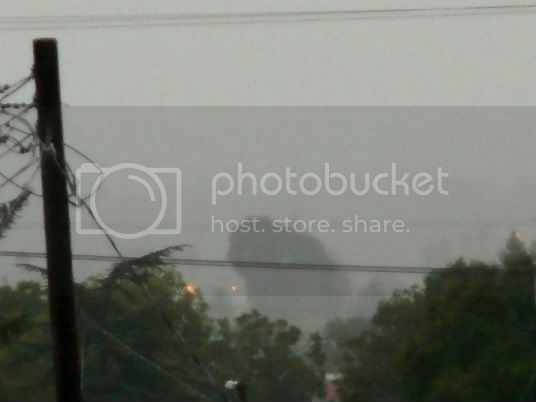 CB, it's a dark and rainy weekend here in Vallejo just like it was about a month ago when I happened to glance out the window up Marin Street from my house one morning, and look: I saw the Titanic sailing up Marin Street from Seafood City. Now, I promise you - I did nothing to the image. You know I don't even have any PS anymore. There it is, the Titanic. Photography doesn't lie, what you see is, is!